Now that you understand more about genetic inheritance, you can appreciate better the complications associated with predicting traits in children. Unfortunately, these complications apply to inherited disease just as much as they apply to predicting a child’s height or eye color. 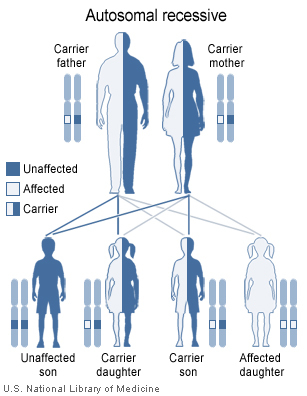 There are over 6,000 monogenetic disorders and thousands more polygenetic disorders. All of this is in addition to the complications brought about by environmental influences and random genetic mutations or damage. Despite this complexity, we continually learn new things about the genetic root of human diseases. This knowledge can be used not only to predict occurrence, as a genetic counselor does, but also to develop treatments, cures, or preventatives as clinicians and researchers do. One organization that puts this modern understanding of genetics to use is the Dor Yeshorim, an organization that offers genetic screening to members of the Jewish community worldwide. Its objective is to minimize, and eventually eliminate, the incidence of genetic disorders common to Jewish people, such as Tay–Sachs disease. Figure 1. Tay-Sachs is an autosomal recessive disease. This means that children can only inherit the Tay-Sachs if both of their parents are carriers for the disease. In both the Ashkenazi and Sephardi Jewish communities, there is an increased rate of a number of genetic disorders such as Tay–Sachs disease, an autosomal recessive disorder that goes unnoticed in carriers, but is fatal within the first few years of life in almost all homozygotes. Dor Yeshorim screens only for recessive traits that give rise to lethal or severely debilitating disorders, providing preventative, rather than diagnostic services. They do not screen for disorders arising from dominant gene mutations, as these cannot be prevented by informed mate selection. Orthodox Judaism generally opposes selective abortion, and although preimplantation genetic diagnosis (PGD) is often approved by Halakha, it is a difficult and costly process. By avoiding marriages between carriers of the diseases, the incidence of the disorders decreases without having to resort to these methods. Dor Yeshorim advocates anonymous testing. Individuals are tested during large sessions in Jewish schools and processed anonymously with only a PIN linking the sample with the candidate. When two members of the system contemplate marriage, they contact the organization and enter both their PINs. When both carry a gene for the same disorder, the risk of affected offspring is 25 percent, and it is considered advisable to discontinue the plans. In the context of shidduchim (a system of matchmaking in Jewish communities), the “carriership check” is often run within the first three dates, to avoid disappointments and heartbreak.